I love finding homeschooling resources that allow my kids to really use their planning and thinking skills, plus their creativity. That’s exactly what the STEM Activities, Full Year of Challenges with Close Reading we’ve been working on have provided. Created by Tied 2 Teaching, these downloadable PDF packets are an amazing resource for integrating STEM activities into your homeschool. I received a downloadable ZIP file containing so many different activities. There are at least four challenges for each month (often related to holidays or events that occur that month), plus several additional files. There were more than 60 of them to choose from! In each file, you’ll find a Close reading activity. To access this, students can use a device to scan the QR code to be taken directly to the reading, or you can use a link and access it. I typically used the link to print it out. We read the passage out loud, as the reading level was a bit high for some of my elementary kids. Then, we worked as a family to answer the questions. Then, it was time for the hands on part! Each project contains a challenge. Students can work in groups or individually to complete the task. They can use a variety of supplies around the house. To help them plan, there are several planning phases. Some are geared for older learners, some for younger ones. We used the one with bigger boxes, as it allowed the most space for drawing. We added STEM activities to our weekly schedule, and typically worked on one each Friday. I printed out the packet, and the reading passage, and then we opened the time together. We read, talked about the passage, answered some of the questions, and then dove into the creating phase. I read the challenge out loud each time, and asked the kids to spend a few minutes brainstorming. Then I gave them each a planning sheet and had them start thinking through their design. They each went and gathered their materials, and then set to work. Sometimes they opted to work together. Most times they each wanted to try things their own way, so they designed on their own. And engaging – my kids worked on these while I knocked out some of my freelancing writing business tasks. When everyone was ready, we had a share session. Depending on the challenge, they either demonstrated, explained, or tested. Then we cleaned up and went on with our day. Everyone is looking forward to the next one, so we will continue using these! I let my kids take turns picking projects. During the review period, they built marshmallow snowmen, created a boat from a single sheet of alumninum foil, made a birdhouse by upcycling something, and figured out how to transport a ping pong ball down a 4 foot zip line. The variety is incredible! There are so many projects to choose from. The challenge was to create a freestanding snowman out of marshmallows and other supplies. Some of the kids worked together on this one. This one was interesting. The kids learned a lot about what didn’t work. Pipe cleaner, for instance, does not go through marshmallows easily. When they expressed frustration, it was a great opportunity to talk about what you can learn from failures. Your plans are not always going to work, so being able to think through what you can change is an essential life skill. They were able to practice, in a fun environment. For this challenge, the kids had to create a zip line that was four feet long. Then, they had to design a carrier that would transport a ping pong ball down it in less than five seconds. We didn’t have ping pong balls, so we substituted for fridge magnets. Be flexible with these and don’t feel like you have to do it exactly like it says! Trying to keep the magnet in was a challenge. It kept falling out. But, he kept thinking of ways to improve his design until he successfully transported it one time. The kids were challenged to recycle something in our house by turning it into a birdhouse that birds could actually live in. They had fun planning, and since we’re learning about birds in science, this one integrated nicely into our typical studies. It was nice for the kids to practice upcycling! For this challenge, the kids had to use a single sheet of aluminum foil to create a boat. But, that wasn’t the end goal. Their boat had to hold the most number of pennies as possible before sinking. This challenged the kids. They wanted to use more materials. They kept asking if they could add this, that, or the other thing to the foil. But, once they put their minds to the task, they had fun. They kept experimenting with designs, modifying, and testing. Once everyone had tested their boats, they worked together to integrate everything they learned to make the best boat possible. They made one that held 72 pennies before sinking, so they were excited! We all loved these projects! They were different from what we typically do, and a great way for kids to practice important STEM skills. The testing and planning that were built in were impressive. I appreciate that there is a reading component built in. The articles were engaging and on a topic related to the project. It was a good way to build background knowledge before jumping in. There’s so much variety – my kids all had a hard time picking when it was their turn. Their favorites that we’ve done so far? We’re all looking forward to building with blocks in our next one! 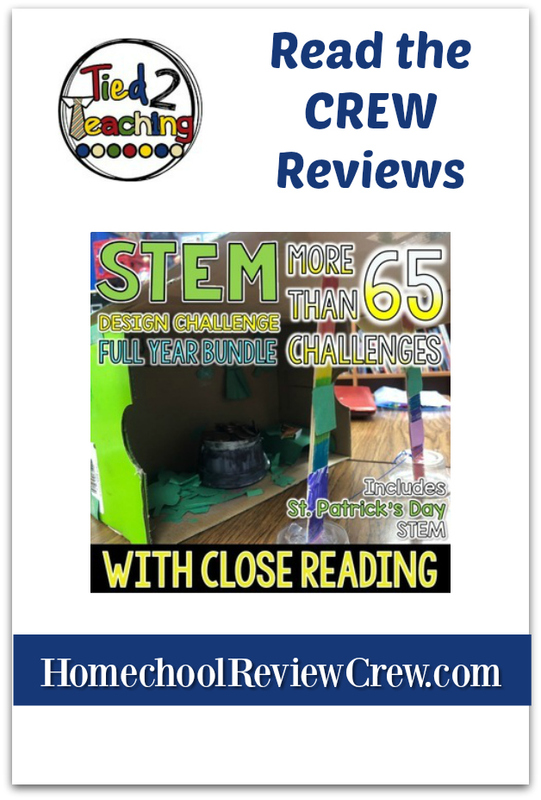 If you’re looking for a fun way to integrate STEM into your homeschool, I highly recommend this set from Tied 2 Teaching!